1. Preheat oven to 375 degrees F. Coat a 12-muffin tin with a small amount of olive oil spray to prevent sticking. 2. Combine vegetables in a big bowl. 3. Place one tablespoon of oats in each muffin tin. 4. Top the oats with vegetable mixture so that the muffin tins are 2/3 full . 5. Whisk eggs and seasonings in a large mixing bowl. 6. Use a measuring cup for the egg mixture and pour slowly into each muffin tin. Egg mixture should fill tin the rest of the way. 7. Bake for 30 minutes or until muffins have risen and are slightly browned. Serve. 8. 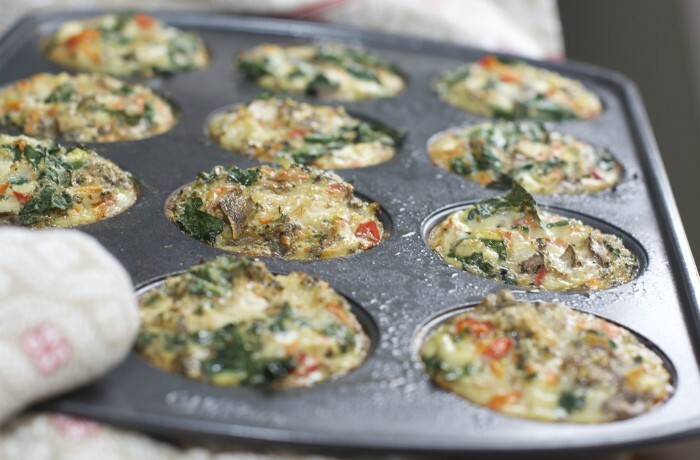 Egg muffins can be stored in the refrigerator in a Ziploc bag for up to one week. Warm one up in the microwave for breakfast and enjoy!